Galaxy Pinnacle, located in Mumbai, is a residential development of Galaxy Construction. It offers spacious and skillfully designed 1BHK, 2BHK and 3BHK apartments. The project is well equipped with all the basic amenities to facilitate the needs of the residents. The site is in close proximity to various civic utilities. Where is Galaxy Pinnacle located? The project is located in Vile Parle (East), Mumbai South West. What is available flat size in Galaxy Pinnacle? Flat sizes in the project range from 760.0 sqft to 1375.0 sqft. 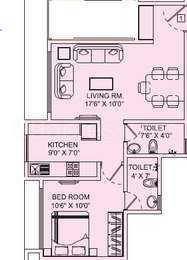 How much is area of 1bhk in Galaxy Pinnacle? The area of 1BHK units in the project is 760.0 sqft. How much is area of 2bhk in Galaxy Pinnacle? Two-room units (2BHK) in the project are available in an area of 1050.0 sqft to 1145.0 sqft. What is the 3 bedroom size in Galaxy Pinnacle? The area of 3BHK units in the project varies from 1300.0 sqft to 1375.0 sqft. How much is the total size of Galaxy Pinnacle?The project is spread over an area of 0.76 Acres.